Contemporary Doors - Homestead Interior Doors, Inc.
Homestead Interior Doors offers a huge selection of contemporary door styles for your modern tastes. 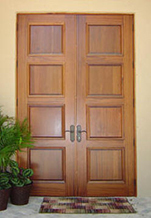 Our doors can be constructed with solid wood cores for the complete realism of a full wood door. We also provide doors with a composite core and an applied wood veneer for the realistic appearance and feel of real wood - for a more practical cost. We have many wood species for you to choose from to make the right door for your home, business, or venue. Our door experts are happy to assist you with your door selection and ordering process - so don't hesitate to give us a call! Please browse this site to get some ideas for what sort of contemporary style you are looking for. You can also go to our main door website at www.door.cc to view a more complete listing of our full door selection. For pricing on any of the doors seen below please call 419-684-9582. Or submit an online quote request.